Wednesday is one of the biggest carb days of the year. Oct. 17 is National Pasta Day and several businesses are celebrating with deals and freebies for the beloved, versatile food. According to the made-up holiday’s website www.nationalpastaday.com, there are more than 600 known pasta shapes. Ranker.com, a crowdsourced rankings website, found the 10 most popular types to be: fettuccine, penne, ravioli, spaghetti, tortellini, angel hair, farfalle, linguine, rigatoni and rotini. October also is National Pasta Month and if one Italian dish isn’t enough it’s National Pizza Month too. Plus, Olive Garden’s Never Ending Pasta Bowl promotion lasts through Nov. 18. Biaggi’s Ristorante Italiano: Join Club Biaggi’s at www.biaggis.com/club-biaggis for discounts. What better way to introduce #WorldPastaMonth than a free vacation?! Now’s your chance to win a trip of a lifetime to Italy! 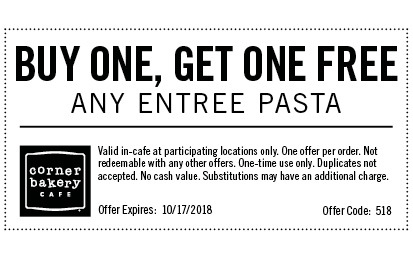 Fazoli’s: Sign up for the chain’s eFamily club at www.fazolis.com/efamily and get a free welcome gift. Jewel-Osco: Grab a free box of Signature Select Pasta on Wednesday by saying “Lots a Pasta” at the register to redeem. Limit one per customer. Maggiano’s: For a limited time, take home a free Classic Pasta when you order any Specialty Pasta, Chef Featured Pasta or other Classic Pasta with the “Today and Tomorrow Pastas” special. Also, join the Maggiano’s E-Club at www.maggianos.com/e-club and get a coupon for $10 off. Giusto Sapore: On Wednesday, the Italian and Mediterranean fine foods company will have a flash sale on Amazon. Get 50 percent off the brand’s pastas with code 50pastaday during the one-day sale. Villa Italian Kitchen: The chain is celebrating its ninth annual “Have a Slice Day” or Wednesday by giving away free Cheese Neapolitan pizza slices. Sign up for a coupon at www.freesliceday.com. Limit one per person.